Next life, I want to be a plumber. 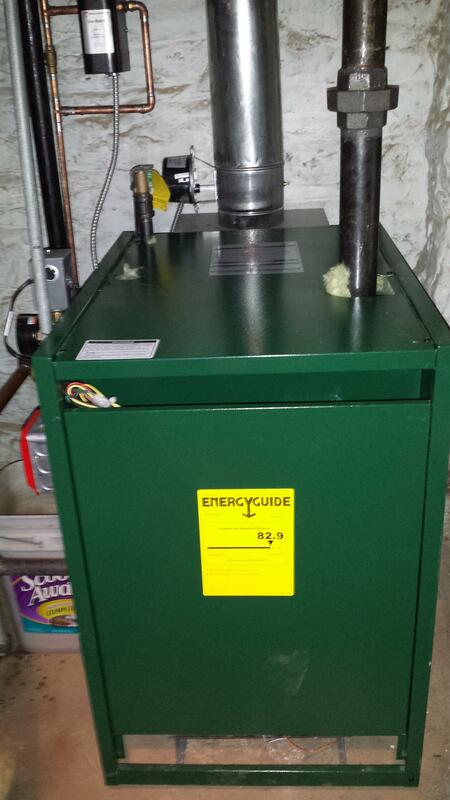 Back in 2011, I wrote an article about my failing Weil-McLain steam boiler entitled Got Three Estimates? Get Three More. The article concluded with my finding a plumbing company willing to rebuild my ancient autofeed mechanism for a fair price. Despite most heating contractors swearing that my 42 year-old boiler wouldn't survive the season, it made it through 2011, 2012 and the brutal, polar vortex winter of 2013 without a burp. Two weeks ago, I relit the pilot light on boiler. The outside temps were in the 60s so I didn't turn on the boiler. A few days later I noticed that my kitchen extension floor was a pool of water. Rats, I'd left the windows open before an intense thunderstorm. Cursing my stupidity, I mopped up about 15 gallons of water and went upstairs. I returned an hour later to see the floor soaked again. The windows weren't the cause. There were no water pipes in the extension and it was bright and sunny outside so I didn't know what was behind this. While mopping up for a second time, I heard an occasional *bloip*, like a leaky faucet into a pan of water. It was coming from the baseboard radiator. When I lifted the access panel I saw water squirting out of the air valve like a drinking fountain. At least I knew what was causing that. It was the autofeed/low water cutoff again... probably a stuck float. No problem, I'll call the same plumbing company that fixed it last time. The guy who showed up wasn't anything like the last guy. He was pushy and a bit full of himself. After he finished his sales spiel about a new boiler I told him I just wanted the autofeed rebuilt again. He said it couldn't be repaired. Hello? I told him that wasn't true because a plumber from his own company rebuilt it three years ago. He denied it again and left me with a bill for $225 bill for...what? Telling me that he wouldn't do anything? Unless of course I was ready to pony up $1400 for a new autofeed. This wasn't the helpful, sympathetic company I dealt with in 2011. Was it sold to some predatory outfit since then? Three days later he sent me an estimate for $8250 for a new boiler. Yikes! That was almost a grand higher than the highest estimate I'd gotten in 2011. The irony was that I'd have to pay an extra $575 for an autofeed on top of that. And if the reaming wasn't deep enough, he pre-checked a paragraph on the contract for an additional $1450 for replacement of my hot water heater whichI didn't even inquire about. Sheesh, the balls. Some people may fall for this heavy-handedness but I'm not one of them. Just to see how greedy this guy was, I googled the boiler he wanted to install: a 105k BTU Burnham Independence Model IN4. And here it is. For $2,344.10, with free shipping from eComfort.com. In other words, these sharks wanted to make $6,481 for one day's labor! Obviously, their estimate hit the trash at high velocity. So it was back to the grind of getting estimates: $7600, $6995, $7300, "between six and seven thousand". Sheesh. I was motivated to just buy the boiler from eComfort and do the job myself. How hard can it be? I've done water, electrical, gas and flue. I've assembled motorcycles from parts. Steam is the only hands-on experience I don't have and it looked like it was just a straight piece of threaded 4" steel pipe. Still, if the boiler didn't work or, worse, it blew up because I didn't know how to tune it I didn't want to have my fingerprints all over it. So I spoke with a local handyman who's installed commercial boilers and he agreed to do the job for $750 + parts. Done. Or so it was until I got my last estimate from Dennis at Bay Ridge Plumbing this morning. Dennis is a boisterous, gregarious, obviously highly skilled heating contractor who also happens to be friends with several customers on the block. I was never successful at getting him to come by for an estimate before but my neighbor is a faithfull BRP customer and called Dennis on my behalf. He dropped by yesterday and said that, yes, he could rebuild the autofeed but, no, he wouldn't recommend it. If it's failed twice in three years it's time to retire it. Judging from the non-stop ringing of his cell phone he was obviously under pressure from lots of customers besides me. He looked at the boiler, took some notes and left five minutes later promising he'd call with an estimate to replace the boiler. He said he'd he'd cut me a break on the price too. I've heard that before. This morning, Dennis called with his quote: $5150 and he can do it next week. Now I had two reasonable estimates. But after factoring in that Option 1 would mean my having to dispose of the heavy old boiler myself, "parts" could run $300 to 500 and it would basically be an illegal job so I wouldn't qualify for National Grid's $500 rebate and Option 2 came with a two-year service contract and professional installation it was a no-brainer. I went with Dennis. One has to wonder why so many NYC parents run themselves deeply into debt putting junior through a $45k/year college only to have them graduate with a liberal arts degree that doesn't even guarantee them a job at Costco. Meanwhile, plumbers are living so large that they won't even compete for jobs that will put at least two grand in their pockets on a low bid for a day's work. Or maybe you don't even have to learn plumbing; just drive around all day on $225 service calls, avoiding doing any work and instead hand out outrageous estimates to which no one in their right mind would agree. What's the worst that could happen?